Low prices. OrangeSmile.com offers car hire service in Puerto Rico on the lowest-rate-guarantee basis, since we work with car suppliers directly. For your search criteria in Puerto Rico, we always select and show the best rental offers. The car reservation process consists of 3 simple steps: (1) search for available cars for your dates in Puerto Rico; (2) select your car type; and (3) fill in the booking forms. Once the reservation is completed, you will receive a confirmation voucher to your email address. During the booking process, please check your rental conditions. To pick up your car at the rental point in Puerto Rico, you need to provide our confirmation voucher, your driving license and a valid credit card. The final payment is normally carried out at the pick-up point. Our car hire points in Puerto Rico accept VISA, MasterCard, etc - please check your rental conditions. At the pick-up point, please read the handling manual and check the car for present defects. 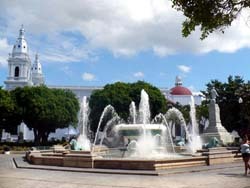 OrangeSmile.com wishes you a pleasant journey to Puerto Rico! The car hire reservation system OrangeSmile.com allows renting a vehicle in Puerto Rico within 10 minutes. Our largest database of car suppliers enables us to provide you a rental car in Puerto Rico at the cheapest rate ever possible. At rental locations in Puerto Rico we offer the following car sizes: mini, compact, economy, standard, premium and luxury. The following car types are available in Puerto Rico: Sedan, Hatchback, Jeep, Cabriolet, Coupe, Minivan and Minibus. The piedmont region is home to the Arecibo Observatory, which is famous thanks to the oldest radio telescope in the world. The telescope keeps functioning and is used to study distant objects in space. Not so long ago the Museum of Science and Space was opened in the observatory. Visitors of this place will learn more about the latest achievements of scientists. Don't forget to visit Rio Camuy Cave Park and Ceremonial Park on your way back from the observatory. The park was founded by the Taíno Indians 800 years ago. Various religious ceremonies, celebrations and important events of the tribe took place in this park. Several buildings and temples have survived till our days. Finally, old buildings and interesting museums can be found in the city of San Juan, which historic heritage is protected by the government.